“I still don’t know [what it means to be Canadian] – but I do know I never want to be anything else,” concluded Rick Mercer at the 2018 Tribute Dinner. And when we look at the extraordinary things made possible by Canadians right here in London, it’s hard to disagree. 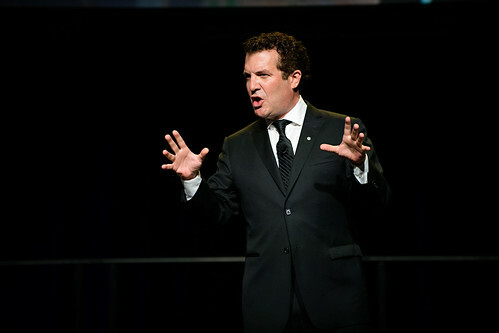 Rick Mercer brought levity and a sense of national pride to Tribute 2018, sharing his reflections on what makes Canada unique in front of a sold-out crowd of 1,200. Through anecdotes and clips from his years on television, his show Canada: Coast to Coast to Coast reminded everyone that heroes can be found in every community. Each year, Tribute Dinner raises critical funds to support the programs, equipment, and research that make good healthcare great – and that often wouldn’t be possible without private donations from our community. We would like to thank John Zubick Limited for their longstanding support of Tribute as the presenting sponsor. John Zubick Limited is a leader in responsible recycling of Canada’s resources in the London region for more than 70 years. They are a family business founded on strong personal values that include giving back to their community. We would also like to congratulate Brian Jones (ticket #0707) for winning the raffle prize of a $10,000 shopping spree generously donated by Nash Jewellers. Thanks to everyone who joined us at Tribute 2018 – hope to see you again next year!